The Villa Premier, part of the Hoteles Buenaventura Group, recently underwent extensive renovation of the entire property. I had the opportunity to explore the hotel the first week after its re-opening and found it lived up to its four-diamond reputation. 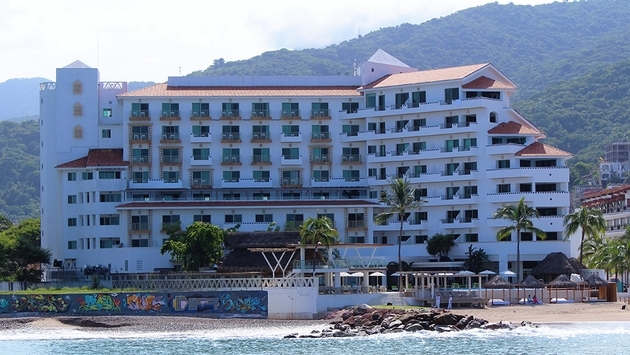 The oceanfront resort includes a spa, two pools, and a total of 83 rooms and suites, all facing the waters of the Pacific in downtown Puerto Vallarta, where the famed Malecon beach boardwalk is a short walk from the hotel. Upon arrival at the open-breezeway entrance, guests are greeted by uniformed staff eager to assist. After check-in, which is a brief sit-down affair, guests are invited to enjoy a five-minute neck and shoulder massage. There is no sales pitch for the spa, just a sincere wish to welcome you to the resort. Memories of airports and travel stress melt away as the therapist works magic. The pampering begins before you ever board your flight. Following your reservation, a welcome email offers you choices of pillows, room fragrances, and nightcaps. Though wine is among those choices, keep in mind that this is Mexico — the tequila nightcap is more in the spirit of the destination. The décor, setting, and staff are geared for romance. The hotel is all adult; no guests under age sixteen are allowed. Buenaventura's sister property-- Buenaventura Grand is next door for families traveling with children, but at Villa Premier the focus is on quiet. From yoga on the beach to rose petals in your Jacuzzi tub, every effort is made to help you leave the rest of the world behind. Colors throughout are soft sand and coral, enhanced by vibrant art in the colors of the sea. Scattered throughout the hotel are messages of peace in the form of prose and poetry in script painted on walls. Breakfast is served in La Cieba, an outdoor restaurant facing the ocean, within earshot of the waves splashing on a nearby jetty. Choices range from American favorites like omelets and waffles, to dishes with a Mexican taste. All dishes are prepared with a visual flair that goes beyond traditional hotel breakfast fare. Among the American choices, I especially enjoyed the Brioche French toast, topped with an over-easy egg. Servers are adept at details that earn high marks from travelers — remembering names and beverage preferences, celebrating special occasions, and even offering farewell wishes written in chocolate on a plate of sweets. Lunch is also served at La Cieba from 1-4 p.m. Dinner is served indoors in the hotel's two sophisticated restaurants. Special requests like vegetarian, vegan, and gluten-free are all available upon request. All-inclusive packages are available that include all three restaurants, open bar and the in-room minibar. All 83 rooms have ocean views with sliding glass doors onto balconies. Suite categories include more space that the standard room, and all suite categories include Jacuzzi tubs in-room. The Honeymoon and Master Suites include outdoor Jacuzzis as well. The color themes are Pacific blue against starch white, with warm wood accents. Evening chocolates are served with the nightcap of choice at turndown. Coffee and tea are provided for use with the in-room coffee maker. The spa is a peaceful retreat featuring muted colors, soft voices, glowing candles, and aromatherapy. Services go beyond the standard deep-tissue massages and include couples massages and romance packages. Spa suites include a complimentary 25-minute massage. Enjoying the outdoors is easy whether you choose to lounge by the pools, perch on an in-pool barstool, or stare at the sea from beneath the canopy of a luxurious Bali bed on the beach. The hotel's service and relaxation follows you outdoors. It is the kind of hotel that begs you to stay put, or beckons you to return from a day of sightseeing or shopping in the city.